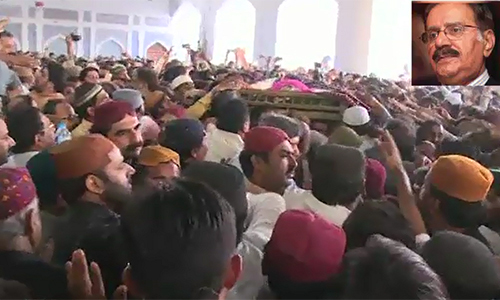 HALLA (92 News) – PPP leader Makhdoom Amin Fahim was laid to rest besides his father Makhdoom Talibul Maula at Dargah Makhdoom Sarwar Noh on Saturday. PPP chairman Bilawal Bhutto, Opposition Leader in the National Assembly Syed Khurshid Shah and Raja Pervaiz Ashraf attended the funeral. Hundreds of people, including politicians, devotees and PPP workers, were also present. Meanwhile, the PPP has announced countrywide mourning on Sunday. Prime Minister Muhammad Nawaz Sharif, President Mamnoon Hussain, PPP co-chairman Asif Ali Zardari, former prime minister Syed Yousaf Raza Gilani, Information Minister Parvez Rashid, Punjab Governor Malik Muhammad Rafique Rajwana and Punjab Chief Minister Muhammad Shahbaz Sharif have also expressed sorrow and grief over the sad demise of Amin Fahim.